My cousins bought these Filipino street food last Saturday. I only ate a little because I am not fond of it, but they enjoyed every bite of these street foods. 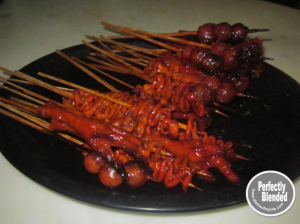 They enjoyed “Adidas”, a grilled chicken feet and the “Isaw” whih is a skewered chicken intestines that are grilled and served with spicy vinegar. Would you like to try one of these?